Boil all chiles and tomatillos for 30 minutes. Add boiled chiles and tomatillos, garlic cloves, oregano, chicken bouillon, and chile water into a blender. Blend. Set aside until ready to use. In a large pot over high heat, add oil and warm. Add pork cubes and braise on each side until browned. Add onion. Pour in chicken broth and bring to a boil. Once boiling, reduce heat, cover and simmer for 3 hours. Incorporate chile verde mix from blender. Cover, and continue to simmer for an additional 1/2 hour. To make the enchiladas: Preheat the oven to 375 °F. Over medium heat, fill the bottom of a large pan with an inch of vegetable oil. Once heated, fry corn tortillas on each side until slightly bendable. Arrange fried tortillas along bottom of a baking dish, and fill the center of each one with a heaping tablespoon of pork chile verde. Add a pinch of Monterey Jack cheese and roll each tortilla into a tube. Continue until the entire baking dish is full, lining up and arranging the stuffed tortillas as you go. Take several tablespoons of the chile verde sauce (excluding the meat) and spoon it over the enchiladas. Sprinkle a little more cheese and sliced olives over the top, and bake for 30 minutes. Remove from oven and top with cotija cheese, to taste. Enjoy! 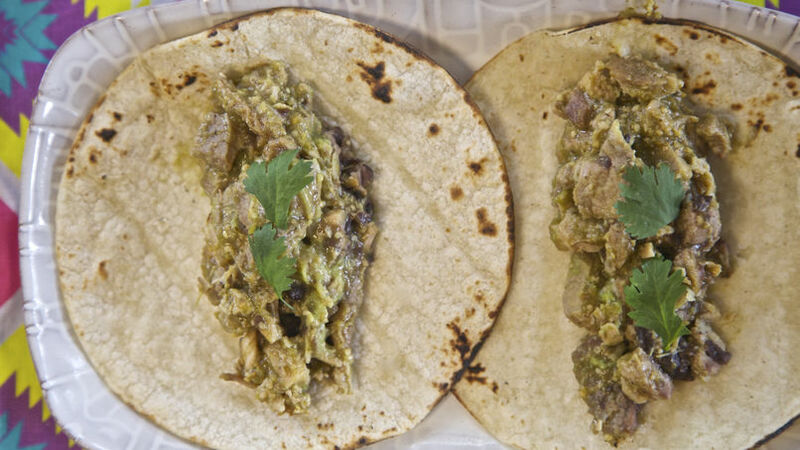 Green chile pork can be made up to 2 days in advance. Usually when I make chile verde (green chile sauce) I make enough for an army and there are leftovers for days. I can't and won't let it go to waste, so I make a big serving of chile verde enchiladas and repurpose my pork chile verde. My family is happy with a new meal set on their plates, and I don't have to hear the nagging question, "This again?"